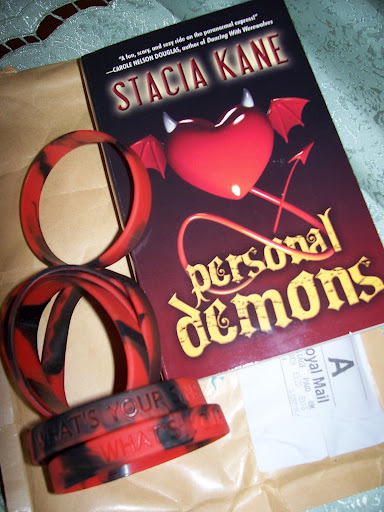 a reader’s squees | Kris + Books = Good. *Sometimes*. It was in late 2007 when I first discovered ebooks and in late 2008 that I first started lurking, then commenting, before pulling out of my arse creating my own blog. I’ve come to really appreciate it when an author takes the time and effort to promote their work and respond to their readers. A number have spoken honestly and openly about the benefits and pitfalls of doing this. I think there is a tendency amongst readers to be embarrassed about being perceived to be too fangirly – or boyly as the case may be. So perhaps we readers are not as open/ public/ whatever about how we feel every time an author responds to a comment or visits our blog. I’m one of those who have been lucky enough to have a few authors drop in – and sometimes play 😉 – here. Question: What makes Kris squee? Answer: When an author personalises a message to me/a reader. 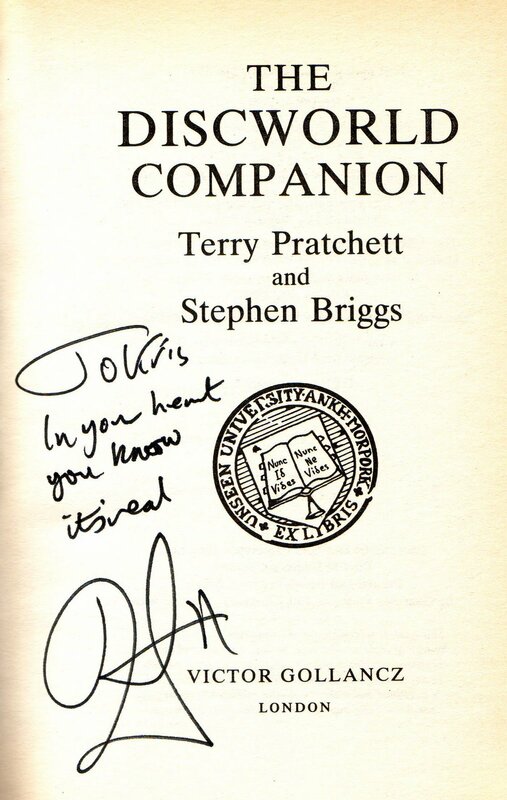 The Evidence: Two of my prized possessions. Now lookee what I got in today’s mail! 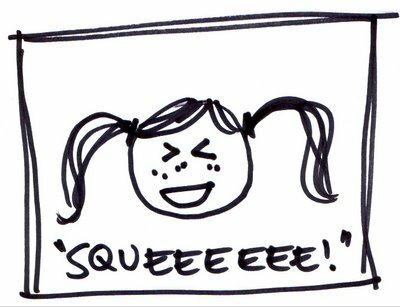 BTW, if someone DARES use MY author squees for the purposes of evil, I will hunt them down and squish them like the bugs they are. 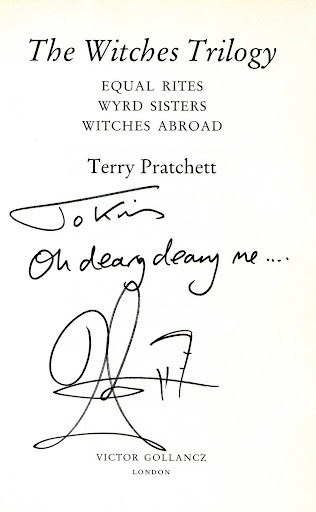 This entry was posted in authors, Jenre, sean kennedy, squees, stacia kane, Terry Pratchett, The Book Smugglers. Bookmark the permalink. Kris – I know exactly what you mean. It still makes me giddy when an author comments on my blog.Even if I’m so in awe that I forget to say anything. Great post, Kris and I agree wholeheartedly. I still get a major kick when an author comments on my blog, even if I feel they have become my ‘virtual’ friend.Clare London was the first author ever to comment on my blog and I was absolutely delighted and thrilled when she did. The first time Josh Lanyon commented on my blog, I went round with a huge smile on my face for ages – even hub commented that I seemed unusually happy. Ooh, look at me with my name dropping!As I’ve said in the past, if I ever become blase about authors who stop by and chat, that is when I need a kick up the backside for turning into a pompous idiot.PS. 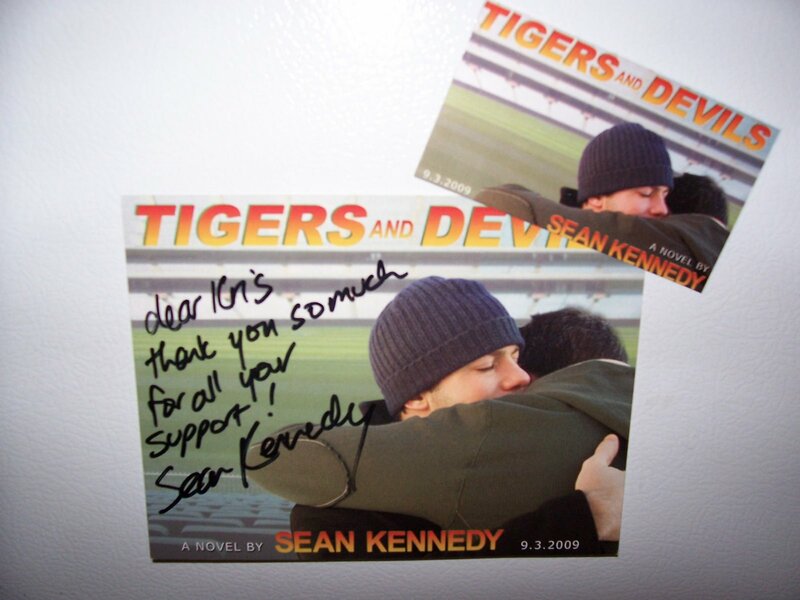 I think I might be getting a postcard from Sean too, except mine’s on the slow boat from Perth so it might be a few week’s yet! Okay, I would squee muchly if that happened. But I’m in that “play it cool” group so as not to appear too fangirly. LOL Oh wait, I’d have to meet an author (besides Robert Munsch) to play it cool. I was pretty pleased with a couple of the comments on my posts yesterday from authors. I guess someone who writes as a job saying I wrote something funny or interesting can’t help but make you feel good. Believe me, it’s the same way round with authors, because we can’t believe people are reading our silly little imaginings and enjoying them, and then taking the time out to tell us so!Kris, I just realised how abominable my handwriting is! Sorry!And Jen, yours are on the way as well!Oh, and I still do like you all, even though the empty document on my laptop curses otherwise. That was a self portrait of my squee when I got your mail yesterday, Sean, and a photo of the post card and magnet on my fridge. Handwriting, schmandwriting. I now have proof for those times when I pull out the “I knew you whens”. lolBig thanks to you for thinking of me. *G*A blank document?? I hope that’s Tam’s were-kanga series and not our story! Hee, hee. If a were-kanga story hits the big time, movie rights, etc. I want a cut. Granted, it was Kris who had the original idea, but I would say as its primary promoter I should get something out of this. At least a cameo in the movie. What do you mean if! Of COURSE the were-kanga story is gonna be HUGE!As to what you get out of it… besides the pleasure of knowing Sean and me before we hit the big time, we will name the first person to be killed by the rogue were-koalas after you. We’ll see about the actual cameo. I love your story about Janny Wurts, Orannia. That is very cool.I think we tend to put authors up on a pedestal and not recognise how they can also have their ups and downs, which means acknowledgement from readers especially those thanking them is as meaningful to them as their work was/is to us in the first place.